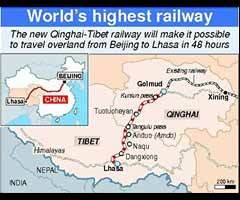 1st July 2006 - The opening of the the World's highest railway. Etd Beijing, Eta Lhasa, Duration : 48 hours. I was still grappling with my holiday plans this year when the news broke out on Saturday. Tibet..the only place which i can picture myself in. I yearn for the untouched nature, the raw landscapes, unexposed terrain. Thats my sanctuary. My escape from this civilised, commercialised, bastardized state.